Contemplative Arts comprise a number of secular disciplines and activities, including flower arranging and photography, that integrate art and culture with everyday life. Each of these disciplines represents a genuine contemplative path; together they bring beauty, vividness and wisdom to our lives and culture. Shambhala Art is art that springs from clear perception and pure expression. To artist or non-artist, the creative process often seems mysterious and magical. How do we give a physical reality to some ephemeral inspiration or abstract truth? How do we create forms that communicate some essential nature beyond the limits of their container? The Shambhala Art Program’s purpose is to explore the creative process and the product we call art from the point of view of clear perception and pure expression. It is about the source of inspiration, how the creative process manifests and finally how what we create communicates that inspiration. 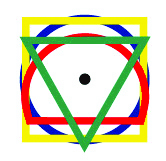 See also www.shambhalaart.org and join Shambhala Art on Facebook. The Shambhala Arts Festival is an international event during which the entire Shambhala community is invited to celebrate the arts based on Shambhala/Dharma Art principles at their Centers. This festival day is an opportunity to gather artists and help establish the roots of enlightened society. Shambhala Art explores the creative and viewing processes and the product we call art from the viewpoint of a meditative discipline. It is a viewpoint that encourages us to see things as they are, rather than how we imagine they are. In 1982, Chögyam Trungpa Rinpoche formed a new school of ikebana (Japanese flower arranging) inspired by his own training and vision. Kalapa Ikebana, as this school is called, promotes the study and practice of flower arranging, often working closely with masters of other schools of ikebana. 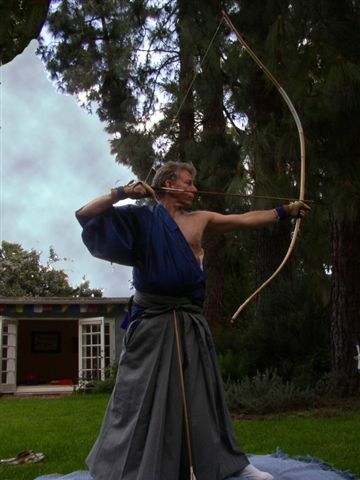 Kyudo means the way of the bow and can be described as a form of standing meditation. Under the direction of Shibata Kanjuro, Sensei and senior instructors, students learn an ancient form of archery using traditional Japanese bows. Kyudo is a form of meditation practice, not sport, and hitting the target is not considered important. The purpose of kyudo is to purify one’s heart and mind to awaken the natural dignity of being human, beyond the obstacles of ambition, aggression or confusion. Miksang is a Tibetan word that means “good eye.” A contemplative art, it is based directly on the Dharma Art teachings of the late meditation master, artist and scholar, Chögyam Trungpa, specifically by his teachings on the nature of perception. The “good” refers to our world, just as it is, is inherently rich and vivid. The “eye” reference is that in working with the practice of contemplative photography, we can tune into these qualities of our world. This journey is actually quite simple-to see with our eyes wide-open and our awareness right there. Once we have a moment of fresh perception, vivid and clear, there is a natural desire to communicate that experience. Through visual exercises and photographic assignments, Miksang is designed to allow the eye and the mind to be naturally synchronized, so that the experience of seeing could be undistracted and present. This practice is based on the principles of the five buddha families, each of which expresses a particular style and attitude of openness. Maintaining a posture associated with each family in five specifically designed rooms heightens the characteristic patterns of energy of each family, so that both the neurotic and sane aspects of the student’s personal style becomes apparent. 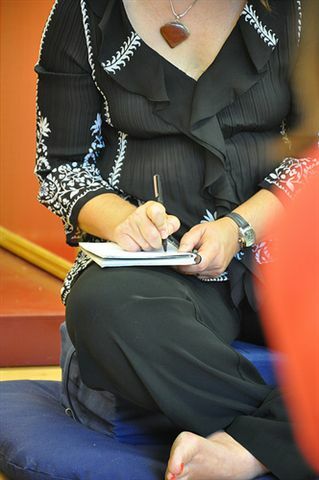 Contemplative writing explores the connection between meditation practice and writing. Meetings will intersperse meditation or contemplation with playful and exploratory writing exercises. Time will be allotted to share writing in a supportive environment. Contemplative writing is not currently being offered at the Seattle Shambhala Center. To find this and other contemplative arts programs at other centers, visit the ‘Find a Program’ page at Shambhala.org.